Kyushu is Japan's third largest island, located southwest of the main island Honshu. Explore destinations throughout Kyushu! Seat reservations can only be made in Japan, at any JR station or travel center in Kyushu, Japan. For passes exchanged on or after April 1, 2016, reservations are free up to the limit. The number of possible reserved seat tickets is up to 10 times for a 3-day pass and up to 16 times for a 5-day pass. Non-reserved seat tickets can be obtained any number of times within the validation period of the pass as before. Charges will apply for reserved seat tickets over the limit. The train journey from Hakata to Oita was incredible. Deeply beautiful scenery and fascinating towns, viewed from a picturesque train and served by helpful staff. A peaceful and luxurious experience. We highly recommend it to anyone. 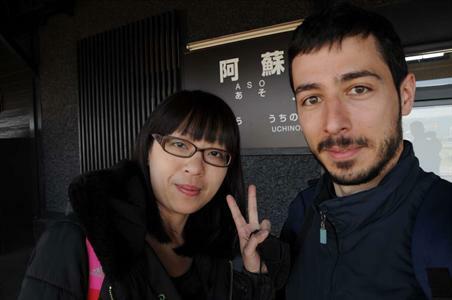 My wife and I loved traveling with our North Kyushu rail pass. As expected, the trains were on time, clean, and very comfortable. The stations were convenient. Personnel at the various station offices were courteous, friendly, and helpful. I stayed in Kyushu for two weeks during the last April, and before the travel I decided to move around the island only with the train. It was a great experience visiting a lot of foreign cities (in particular Kumamoto and Beppu) and looking at new landscapes during the travel. I was very surprised about the services on board, the cleanness and the punctuality. I hope to come back soon in Japan! I used this instead of the national Japan Rail Pass. I took the shinkansen bullet trains multiple times to crisscross the island and was able to hit multiple prefectures at great savings! Very happy I used this, easy to redeem too for English-speaking travellers. Highly recommended! We purchased a 5 day pass for Southern Kyushu travel, and a 3 day all Kyushu pass to manage our travels. We presented our coupons at the JR office in Nagasaki. In spite of some language challenges we were able to get our passes validated and make our reservations. The staff was very helpful and worked hard to make sure all of our arrangements were correct. We had never used an electronic coupon before and were very happy when the info provided was recognized by the JR Kyushu system. All in all it was an easy way to get our passes from North America. The Kyushu Rail Pass was perfect for exploring the major cities of Kyushu, which can be reached by trains. Unlimited use of Kyushu Shinkansen was very generous, making travelling between Kumamoto and Hakata (Fukuoka) took just a blink of an eye (~40 min), comparing to 2 hr on regular train or highway bus. JR Kyushu has done a perfect job in attracting passengers and travellers with various sightseeing trains, such as the Kyushu Odan (Kumamoto-Beppu) and Yufu no Mori (Hakata-Yufuin), where the train ride itself is an amazing experience with theme-matching interiors, train hostess, snack boxes and souvenirs. These all added up to the marvellous destination they were taking us. The only thing to be consider before buying this pass is that Kyushu trains might not reach the smaller towns, so if you're planning to visit a lot of those, a bus pass or rental car might be a better option. Apart from that, go on, grab the Kyushu rail pass and let it takes you to experience Kyushu! It was really convenience if you want to travel all around kyushu, and you save up a lot of cost :) It was a really nice experience! very clean and nice and I enjoyed it! The Kyushu All Rail Pass (Full Island) was an excellent choice for sightseeing around Kyushu. We went from Kagoshima City to Kumamoto to Hakata to Nagasaki and returned using the Kyushu Pass. The only downside was initially getting the passes validated for use at the Kagoshima station. They took more than 1 hour to get us the passes. Not sure why. Otherwise, the Rail trips took us to the city centers of each of the cities with access to trolley and bus transportation for further sightseeing. I would highly recommend the Kyushu Rail Pass to anyone sightseeing around the island of Kyushu. An outstanding value! Kyushu is beautiful and JR Rail Pass is the best and the cheapest way to see it. The only problem was, because it's such a popular deal, there's a long line in the JR office to get the actual ticket which you have to exchange with your coupon (printed out from the internet booking). Go to the station early and line up early if you have to get on a morning train. Started from Hakata Fukuoka and rode the train for 5 days visiting Nagasaki,Kumamoto, and Hustenbosch the train was very clean and the ride with the country side passing by was awesome. It would have cost a lot more with out the green pass and having the green pass we had reserved seat thru out the train ride. Pay a little more, it is well worth it,we had a party of 10.